The short answer is yes. Don't just buy an extra gallon of cheap paint to act as the primer. On new construction, drywall compound absorbs paint at a different rate than the papered surface. Primer evens out the porosity of the surface and gives a nice, uniform sheen to the topcoat. If used over existing paint, primer can block stains, help hold new paint to glossy surfaces or hide imperfections. There are also primers for use on siding and metal surfaces. Make sure that the type of primer you buy is compatible with paint you are using. Always check the label. Generic - Usually intended for use on new construction. Evens out the porosity of the surface to provide a nice even sheen to the top coat. Stain-Blocking - certain types of stains will bleed through new layers of paint. Stain-blocking primers prevent the stain from working its way up through the paint. Rust, tar and crayon stains are good examples. 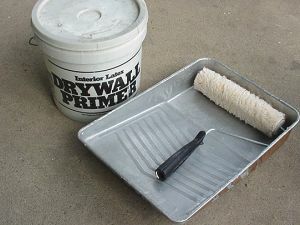 If you are using this over mildew, kill the mildew first and ask for a mildew-resistant formulation at the paint store. High-build - No wall is perfect. High-build primers build the thickness of the paint coat quickly. This helps hide imperfections in drywall work. Sanding into joint tape is a common mistake, this type of primer helps to hide it. "Bonders" - These primers are intended for use on glossy surfaces such as gloss, semi-gloss and lacquer finishes. They help hold the next layer of paint on.